Is There Really a Secret Formula to Serious Business Growth? This book shares a story of successful start-ups, multi-million pound rescues and family tragedy before focusing on the practical 'how-to' for you so you can take the steps needed to take your business from where it is now into multiples of profit. Daniel founded his first company in 2002 in Australia at the age of 21. Within 13 months the company was turning over approximately AU$1M. He has since launched over 9 businesses and products into new markets with most ventures achieving 6 figure sales in the first 3 months. In 2006, Daniel moved from Australia to launch an office in London. Arriving with only a suitcase and a credit card, Daniel quickly set about building his connections in London. In the first 12 months of operation in the UK, Triumphant Events achieved more than GBP1M in sales and Daniel was considered as one of the Key People of Influence in his industry. Daniel is in constant demand around the world and speaks to audiences throughout Asia, Australia, Europe and the United States. He speaks from his personal experience of spending large sums of his own money on marketing and advertising, building sales teams, recruiting and retaining high performing teams. Daniel has been able to build successful companies that continue to run even when he has been overseas for 6 months at a time. Daniel is passionate about social entrepreneurship and is a business advisor and fund-raiser to several charities / not for profit organisations (or not for dividend as Daniel would say). 5.0 out of 5 starsReally valuable book!!!! Wow, what a great book. This is an extremely interesting story of a person who bounced from job to job, career to career, all the time looking for the pattern of what allowed him, and the companies he worked for/ran, to be successful. He has since gone on to be a consultant/coach to hundreds of companies around the world on how to improve and scale their businesses. This was a fun story to read, with tons of great advice, and some very simple – but exceedingly powerful – ideas for how to grow your business in a way that allows you to scale it and still have life balance. 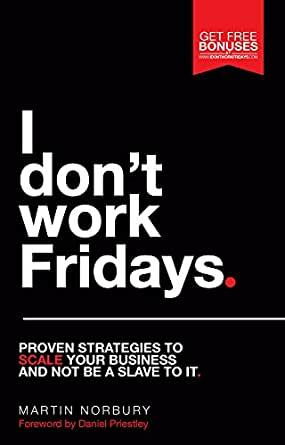 I've spent 20 years studying businesses around the world and I really felt this was a fantastic read with truly valuable ideas.